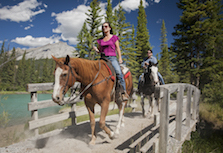 We promise to give you the best Banff horseback riding vacation possible – even if you’re a Greenhorn. Unlike other wranglers, the gang at Banff Trail Riders is driven by a single goal: ensuring you get a comfortable Banff adventure that takes you to places you wouldn’t otherwise get to see. It’s why we spend so much time hiring the best guides, preparing tasty meals for our cookouts and overnight stays, and planning trips that make you feel like you’re right in an old western flick. We’re pretty darn proud of what we offer. Banff Trail Riders has been helping travellers since 1962, it’s a tradition that we are proud of. We follow the same historic routes that the original explorers of the Canadian Rockies carved through the bush back in the 1920s. We’ve been guiding along these trails for so long, you’ll get to see amazing places others would miss if they made the trek on their own. With over 300 horses at our stables, we’re able to pinpoint the absolute perfect horse for any rider that comes our way. That also means that if you have never been riding before, we will be sure to pair you with the most mild-mannered horse available. You will be able to enjoy a nice and safe ride. After all – we here at the Banff Trail Riders want both seasoned horsemen and horsewomen as well as new riders to have the time of their lives! When pioneers first began to explore Western Canada, horses offered the most efficient way to navigate the craggy, steep terrain of the Rockies. They pressed through the unexpected brush to open up new trading routes during the 1800’s. Around the turn of the century, the Canadian Pacific Railway began promoting places like Banff National park as thrilling Alp-like destinations for the world’s most elite travelers. Everyone was eager to explore the farthest reaches of this untouched wilderness. We could go on and on about the history of this place, but we’d rather tell you all about in on a trail ride instead. We would love to have you come join us some day!